Rising inequality: American towns are spending more, like Scandinavia. American towns are also spending more on social programs as inequality rises. 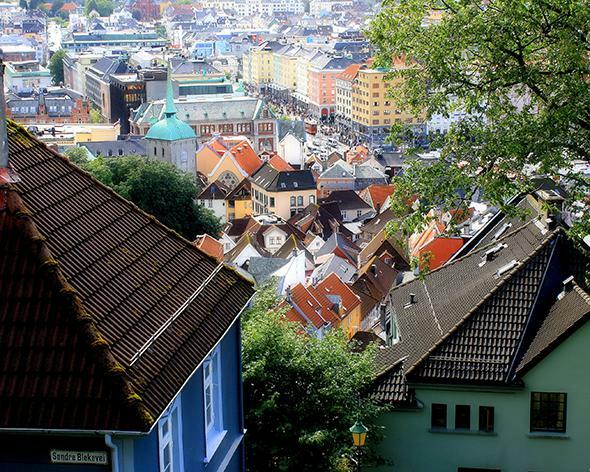 If you lived here, in colorful and idyllic Bergen, Norway, you’d reap the welfare benefits funded by the high cost of living. The New York Times travel section, not known for its frugality, recently warned readers about the sticker shock of a Scandinavian vacation. “Prices do mean that unless money is no object, you’ll need to modify expectations,” the piece advised. In Norway, a burger and fries at a fast food joint will set you back $23. A six-pack of warm grocery-store beer is nearly $30. These hefty price tags are due, in part, to high wages for low-skilled service jobs. But high taxes play a role too. Most products have a 25 percent value-added tax, which means that $5.50 of the cost of that burger goes to fund Norway’s generous social programs. As a visitor, you get little for the added price. But, as a resident, your daily spending helps to fund an expansive package of benefits, including health care, child care, high-quality education, pensions, and unemployment insurance. While many Americans admire European social safety net, what they may not appreciate is that these programs are typically paid for by a bundle of taxes that are much less progressive than taxes here. In large part, these benefits are not funded by high-income taxes on the rich. Instead, the beneficiaries of the public services also pay for them, kroner by kroner, through high consumption taxes. Could this system work to combat income inequality in the United States? Usually, the assumption is no, even though the most popular social insurance program in the country, Social Security, fits this template. We’ve recently published research that adds surprising support for the argument that the European model of progressive spending funded by broad-based taxes could work more widely here—by showing that it’s already happening at the local level. With our co-author, Fernando Ferreira, we examined three decades worth of data from more than 5,000 American municipalities and school districts. We found that, as inequality rises, American cities and towns have been spending more on the poor and the middle class, funded by higher taxes on these groups. Because most cities don’t have the power to tax income, they usually use property and sales taxes, which tend to hit all residents or fall more heavily on those who are middle class or lower income. As in Scandinavia, people are paying for their own increased services. Our finding that municipal spending rose alongside inequality runs contrary to the view of many economists, who say that income inequality erodes support for essential public investments. We find that the increase in income inequality experienced by the typical city is associated with an $88 increase in expenditures per resident on top of the $900 per resident on local services spent by the typical city each year. The additional $88 of funds are allocated across the board to cover police services, fire protection, road maintenance, education, and more. We document similar patterns for a large sample of school districts (although state involvement in school finance equalization complicates the picture somewhat). Our study included large cities and small towns all over the country, which allowed us to make regional comparisons. We found that government responses to local inequality are stronger in some parts of the country than in others. The same increase in income inequality is associated with a hike of nearly $200 in spending per resident in Western states, but only $13 per resident in the South. Racial divisions might explain why southern municipalities are less responsive to changes in income inequality—if, for example, better-off white residents are less willing to pay for services provided to poor minorities. At the same time, we find that the localities that have become more racially diverse over the past 30 years tend to spend more—not less—on public services. They also raise more revenue from state and federal sources, as well as their local tax base. Another explanation for regional difference could be that southern mayors are more likely to run on a Republican ticket. However, we find that the propensity to spend more as inequality rises does not vary according to the political party of a city’s mayor. This finding is consistent with other work, by Ferreira and Joseph Gyourko, showing that, despite large partisan differences in national politics, Democratic and Republican mayors spend similar amounts in similar ways. Likewise, rich and poor towns are equally likely to increase expenditures when inequality rises. They do, however, use the money differently, with poor towns spending nearly all of the added revenue on police and fire services, while richer areas allocate the added funding across the board. Two factors may explain why so many American municipalities spend more in times of rising inequality. First, like Social Security, local expenditures tend to be directed at broadly popular services like road maintenance and education, rather than aid to the poor. Second, as in Western Europe, the property and sales taxes that support these policies do not fall disproportionately on the rich. Recently, both President Barack Obama and New York City Mayor Bill de Blasio have proposed funding new social programs by raising taxes on the super-rich. We have no problem with the idea of taxing the wealthy. But to reduce inequality, what matters is the combined progressivity of government taxing and spending—not the structure of the tax system alone. Our findings suggest that a more sustainable path lies through shared taxation that pays for broad government investment. It doesn’t just work in Scandinavia. It’s happening in our own cities and towns.